My husband Lulu planted 19 types of tomato plants and we're picking more tomatoes than we can possibly eat. It took Lulu and his youngest sister almost 2 hours to pick 11 pounds of Sungold, Sweet Million and San Marzano tomatoes. They also brought in 4 very flavorful red onions. If you know me, you know I hate when food goes to waste, so I made tomato sauce out of necessity. I got the girls involved and asked them to stem and cut the tomatoes and onions. It didn't take much effort, especially with the help of my strong, toned and muscular (since they've become my morning workout buddies) sisters-in-law. 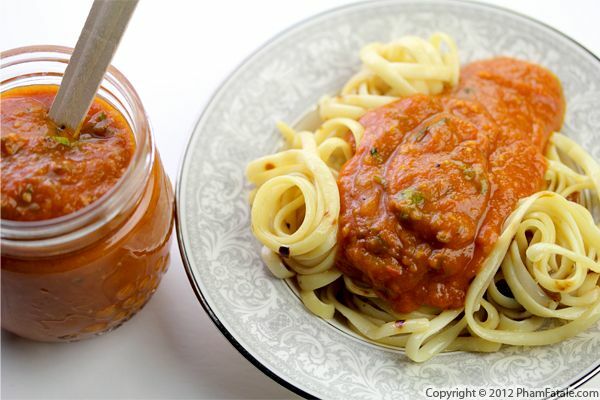 It doesn't take many ingredients to make a delicious thick tomato sauce. I used exactly 7; tomatoes of course, garlic, red onions, fresh thyme, basil, salt and Bhut Jolokia Ghost Pepper Sauce that I received from my friend JD Cowles (check out my product review) at All Spice Cafe. I deep-fried large morsels of fresh garlic, caramelized the onions and stewed the tomatoes for 1½ hours. I haven't tried canning tomato sauce yet because of a fear of botulism, but this time it wasn't even necessary since all the tomato sauce was so good it was gone after two meals! The idea for this Mediterranean salad was inspired by finding fiddlehead ferns at my local market last week. The tight coil of the young fern is very similar to cappelletti pasta and I thought mixing them would make a pretty dish playing with odd shapes and colorful ingredients. This week I was able to buy the pasta but unfortunately the market doesn't carry fiddleheads anymore. It didn't stop me from making a delicious dish... I just substituted beautiful haricots verts in place of the fiddleheads. I combined the coil-shaped pasta with red onions, carrots and celery that I received this evening from Full Circle and heirloom tomatoes from our garden. 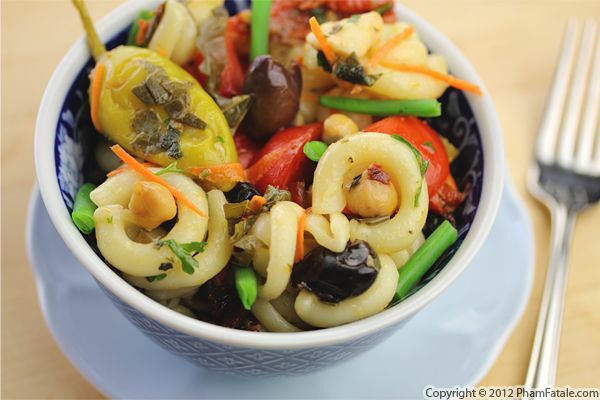 To the summer pasta salad, I also added garbanzo beans, hearts of palm, olives, pickled grape leaves and sun-dried tomatoes to complete the one-dish meal. No ingredient is irreplaceable; you can always substitute in an equally delicious element. All that really matters is a visually appealing and tasty dish. I almost forgot to mention that all PhamFatale readers will get $10 off for your first box order from Full Circle. If you're interested, use the promo code SOCIAL10 upon sign-up. Bon appétit and enjoy farm fresh, organic vegetables! 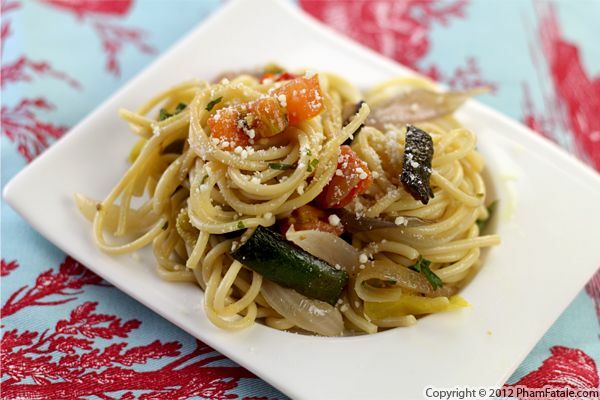 What makes this pasta primavera so flavorful is that the vegetables are roasted, so their natural sweetness bursts and they remain the main focus of the dish. I cooked onions, zucchini and summer squash until they caramelized, then added a variety of colorful tomatoes. I boiled some spaghetti on the side and as soon as it was cooked, I tossed the pasta with the roasted vegetables and topped it off with a sprinkle of Parmesan cheese. You could prepare this dish with any kind of vegetable or herb, but I just used what was ripe in our garden. And it tasted fantastic! Who ever said healthy and tasty couldn't go hand in hand? If you've been following the meals I've been cooking for my family recently, you've probably noticed the abundance of beets in the dishes. I try my best to make a wide variety of dishes, even though they all revolve around the same ingredient. So this recipe is made with --you guessed it-- beets and beet greens! I sautéed the greens with onions, fresh thyme, tomato paste and a bit of vegetable broth. The taste is very similar to collard greens. Of course, you could always replace the beet greens with collard greens or kale. 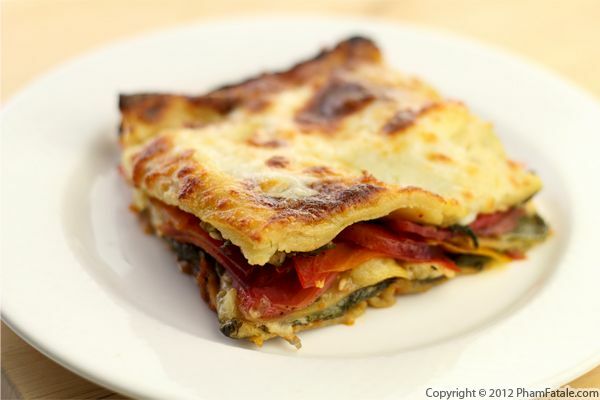 To ensure the beet greens were well appreciated, I utilized them in layers of lasagna. 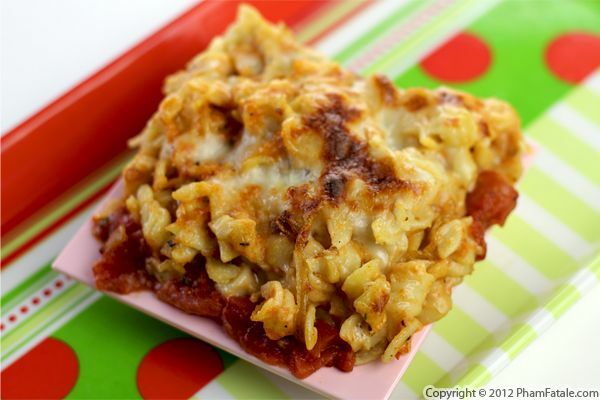 The key is to add generous amounts of béchamel sauce and cheese. Prepared this way, all the beet greens and beets were used up and I bet no one even really noticed I had served such large portions of greens! Page 14 of 21 pages.